This week's challenge at SHOPPING OUR STASH is to use something soft...flock, felt, flower soft, satin, fabric, puffy tail on a bunny, etc. I had so much fun making the ATC for last week's challenge, I decided to make another ATC for this week's challenge...and if I do say so myself I am pretty happy with how it came out. Be sure to visit the SHOPPING OUR STASH blog for all the details on this challenge and while you are there visit the blogs of my SOS teammies and show them some crafty love! I'd definitely go with soft for your bunny. ;) Sweet, soft (!) card! So sweet, love it Donna. I love the bunny's tail. way to use the cotton ball. 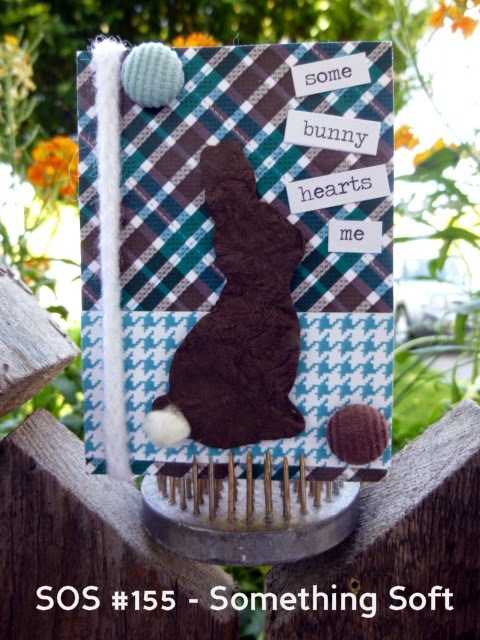 Great colors, patterns and a super cute bunny, complete with fuzzy tail and corduroy buttons! Cuteness!